This is Walk the Way. Brought to you by Q Place. I’m Jeff Klein. And I’m Pam Klein. I grew up with this version of the gospel: I sinned, Jesus died for my sins, accepting Him into my heart would lead to forgiveness and I was Heaven bound. 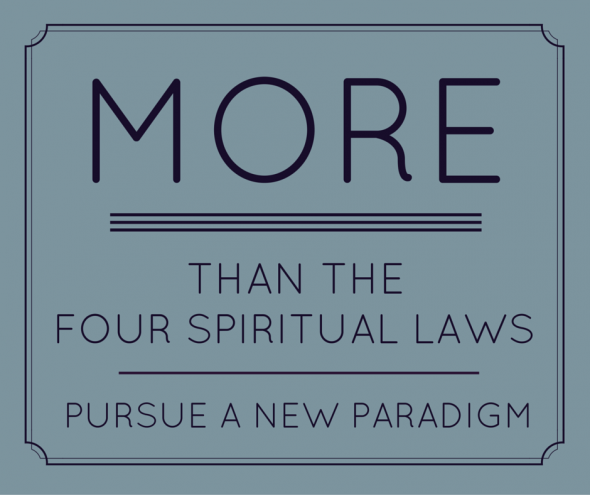 Those four principles, known as the four spiritual laws, were originally developed to help people share their faith – and they did simplify huge, mysterious, mind-boggling concepts into a concise framework of understanding. But somehow, they took on a life of their own, almost to the extent that if a person doesn’t recite those exact progression of words in a prayer, they can’t be saved. But what happened to the vast and mysterious idea that there is a God who longs to be in relationship with us? And that He’ll stop at nothing to pursue and woo us to bring us to Himself. My guess is, He brought me to Himself differently than He brought you or your friend or your neighbor. How about dumping the formula and pursuing a new paradigm? For more on that paradigm check out www.qplace.com/walktheway. Inspired, blessed or challenged by what you heard? Ask your local Christian radio station to add the Walk the Way radio minute to their program line-up by clicking here. And make sure to check out the Walk the Way Facebook page. You can join the community there for daily, vibrant spiritual conversations. Thanks for listening!